While Apple brought a system-wide Dark Mode with macOS Mojave, we’re waiting for iOS 13 to bring that to iPhone and iPad. However, there are some apps that offer a dark mode now, follow along for how to use dark mode with Apple Books on iPhone and iPad. 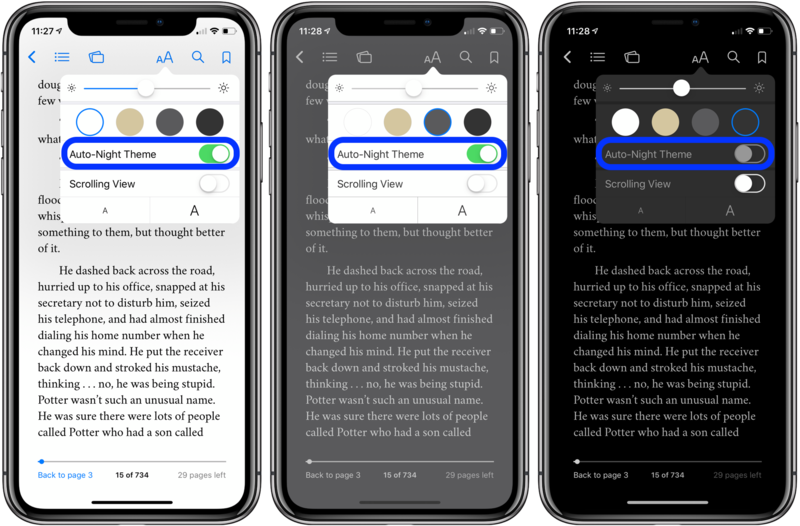 Apple Books offers manual control of two dark modes as well as an Auto-Night Theme option. One thing to keep in mind, if you choose the black dark mode for Apple Books during the day, it will toggle off the Auto-Night Theme. After opening Apple Books, choose a title and tap on the screen to see the options up top as shown below. If you’re okay with using white, sepia, or gray during the day, you can make use of the Auto-Night Theme for your dark mode implementation.